:Full-time FindingJoy.net blogger, speaker, marketer, podcaster, and single mom of seven, Rachel Martin presents a pivotal book for moms to spark the hope they need to overcome self-doubt, fear, pressure, and isolation. By drawing on anecdotes and lessons from her own life, Rachel empowers moms to forget their past mistakes, celebrate what they've already accomplished, and dare to be real about their struggles. She teaches them to cheer each other on toward better days, so that "alone" is replaced with "comradeship" and "fear" is replaced with "courage." 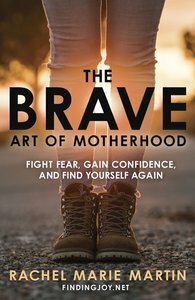 About "The Brave Art of Motherhood: Fight Fear, Gain Confidence and Find Yourself Again"
RACHEL MARIE MARTIN, having pulled herself up from poverty to being named one of Inc. magazine's top 40 entrepreneurs, has been writing Finding Joy full time for several years and writing online for over a decade. She has always had a passion for a daring, adventure-filled life and is often requested to speak and motivate others with her vivacious energy and deep belief that life is a gift. Rachel is also a partner in Blogging Concentrated, the world's largest training and development company for bloggers, authors, and entrepreneurs. She travels worldwide teaching marketing, voice, messaging, social media strategy and more. Rachel is a single mother seven and lives in Tennessee.